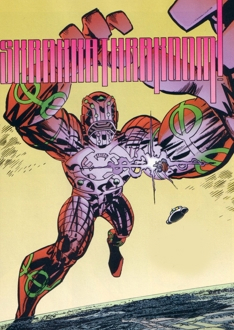 Other Distinguishing Features: Universo is an energy entity that inhabits a gigantic suit of armor, making him visible across an entire country while standing in one location. There is precious little known about Universo, even that name was only coined by Dragon as a means of describing him. The entity known as the Devourer of Worlds travels throughout the galaxy, consuming planets as they are the only objects large enough to satiate his hunger. He deploys his herald, Mother Mayhem, to choose his next feast and awaits the signal to follow. Universo arrived on the first Earth that Dragon called home to claim his next meal and was immediately opposed by Battle Tank, who was dispatched just as swiftly. The Special Operations Strikeforce was dispatched by the government after the military prove completely ineffective. These heroes were incinerated in a single blast, leaving Universo unopposed in his quest. The mechanisms utilized by Universo were assembled and he consumed the entire planet in mere moments. Most of the world’s inhabitants were claimed by this cosmic entity, a few survived only thanks to a retreat into the Void. When the Earth was gone, Universo proceeded onwards, looking for his next meal, sending Mother Mayhem out into the depths of space. In the neighboring reality where Dragon now resided, Universo’s approach had been detected by Vanguard who warned the Liberty League of the impending doom. They were able to create a weapon that was capable of draining his life-energies. When Mother Mayhem arrived on Earth, she was defeated in battle by Dragon. While she was locked away by the authorities, a signal had already been broadcasted to her creator. Universo appeared on Earth where the Liberty League approached him, unleashing their device which then exploded due to the amount of energy absorbed. Dragon then used a Martian shrinking gun to miniaturize Universo. Although the entity was still quite large, Dragon was able to pummel him into the ground until he could be safely locked away aboard Vanguard’s starship alongside his herald. Several years of captivity left Universo eager to escape and renew his feasting throughout the galaxy, and Mother Mayhem constantly warned Vanguard that this was inevitable. Universo slowly absorbed the energy used to imprison him so that when Mister Glum destroyed the starship in his attempt to kill Dragon, he was able to make his way back down to Earth. Universo immediately set about absorbing the entire planet’s life-force, prompting Dragon and SuperPatriot to lead a small group of heroes to terminate him. This effort failed and Universo was all set to consume the planet when Solar Man joined the fray. He swiftly overwhelmed the cosmic entity and destroyed both him and his herald.